Like countless others Sam Harper was an American war hero fallen from grace. After multiple tours from Vietnam through Desert Storm and recipient to numerous awards including the prestigious Purple Heart - Sam met his untimely death in the deserts of Kuwait. When the news reached his home town his number one fan nephew Jody Baker and his late wife Sally shared mixed emotions. Jody is determined to keep the legend of his Uncle Sam alive and wife Sally could finally put her fears to rest. 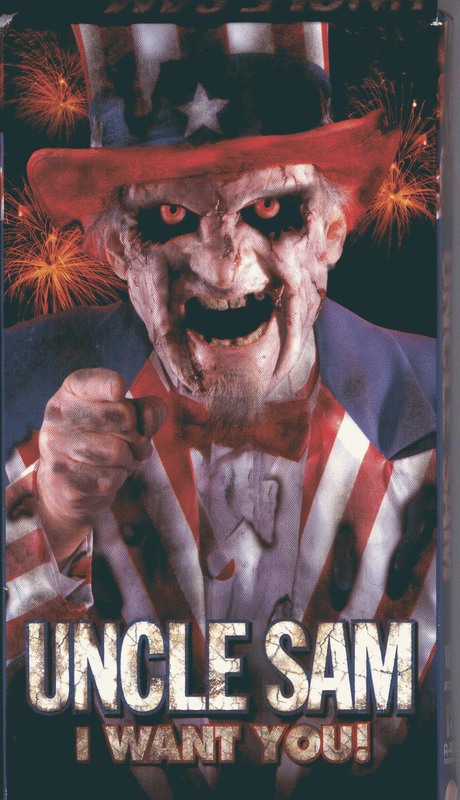 In preparations for his funeral, coincidently around 4th of July, Uncle Sam returns to ensure that his patriotic ways are still celebrated and to make sure that freedom is something not taking lightly. It is now up to Jody and fellow veteran Jed to determine if Sam's "American Way" is in the best interest of the townspeople. Lustig and Cohen’s greatness comes through in this low budget patriotic horror flick. This movie is a must see for any genre fan. Interesting back story, fun acting and vicious kill scenes. The only major surprise to this movie is the lack of people who saw it – many remember the box cover art or the posters but few actually watched the film. If you are one of those who missed it – stop reading and catch it on Netflix Instant. If you have watched the film then you understand my enthusiasm. The only down fall to this movie is the predictability, no real surprises here, however the fast paced nature ensures that that the viewer doesn’t become bored with it. I personally think Lustig is a horror genius and of his movies this ranks number 3 behind Maniac and Maniac Cop.